The 2017 Masters just got a lot more interesting, but in a very unfortunate way. The world’s No. 1 player, Dustin Johnson, might not play according to a statement from his manager. ESPN’s Tom Rinaldi reported that Johnson was walking down stairs with hardwood floors in his socks and slipped falling on his lower back and elbows. Rinaldi also reported that the injury is muscular in nature and that Johnson will be reevaluated Friday morning. A back injury is probably the worst thing a golfer can have happen, but particularly to a player like Johnson whose game has a lot to do with the fact that he absolutely torches the golf ball off the tee. He’s been top-three in driving distance in every season since 2013. If you want to see what back injuries can do to a golfer may I point you to: Woods, Tiger. To say Johnson, who is the betting favorite, was hot coming into this tournament would be an understatement. Johnson’s won his last three starts and has been top-six in six of his last seven events. He joins Rory Mcllroy, Woods, and Greg Norman in an exclusive club. 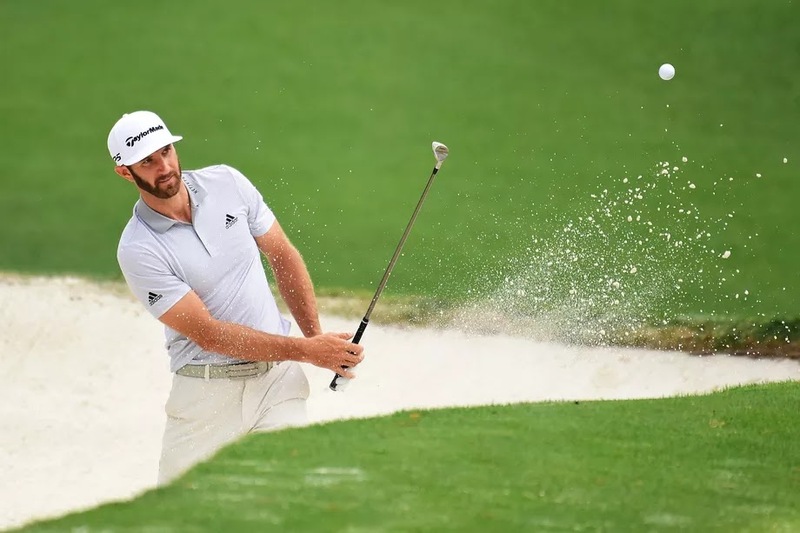 AUGUSTA, Ga. -- Dustin Johnson took a serious fall on a staircase Wednesday and injured his lower back, and his manager said it was uncertain whether the world's No. 1 golfer would be able to play in the Masters. It was a stunning development on an otherwise quiet day at Augusta National, where the course was shut down at 1:30 p.m. ET because of storms. The real calamity struck a few hours later. David Winkle, Johnson's manager at Hambric Sports, said his client fell on the bare wood stairs at the home he is renting in Augusta. Johnson's trainer, Joey Diovisalvi, told Masters Radio on SiriusXM on Wednesday night that Johnson was going out to the garage to move a car when he slipped on three wooden steps. Johnson landed on his lower back and both elbows. "He landed very hard on his lower back and is now resting, although quite uncomfortably," Winkle said in an email. "He has been advised to remain immobile and begin a regiment of anti-inflammatory medication and icing, with the hope of being able to play tomorrow." Diovisalvi told SiriusXM that they are optimistic Johnson will be able to play Thursday, but first they will have to see how he feels in the morning. What might help Johnson is that he is in the final group for the opening round, scheduled to tee off at 2:03 p.m. ET with two-time Masters champion Bubba Watson and PGA champion Jimmy Walker. Johnson was an 11-2 favorite to win the Masters entering Wednesday, according to the Westgate Las Vegas SuperBook. After news of his injury, his odds dropped to 7-1, the same as Jordan Spieth and Rory McIlroy. Johnson has had his share of mishaps in a major but not before the event even started. On Tuesday, Winkle described Johnson as being "in as good a shape as I've ever seen him in every aspect of his game and his life." On Wednesday, Johnson was at Augusta National to play nine holes before the first wave of storms moved in. Johnson has won three straight tournaments -- including a pair of World Golf Championships -- heading into the Masters to rise to world No. 1. He had been scheduled to attend the Golf Writers Association of America annual dinner Wednesday night to accept its award as male player of the year. He was coming off a season in which he won the U.S. Open for his first major, was voted PGA Tour Player of the Year for the first time, won the PGA Tour money title and captured the Vardon Trophy for the lowest adjusted scoring average. If he is unable to play Thursday, Johnson would be the fourth world No. 1 to miss a major championship, joining McIlroy (2015 Open, ankle), Greg Norman (1988 Open, wrist) and Tiger Woods, who missed the 2014 Masters (back surgery), the 2008 Open (ACL surgery) and the 2008 PGA Championship (ACL surgery). Winkle said he would not have any further comment until he knows more about Johnson's condition. If Johnson cannot play, there are no alternates at the Masters. Pre-tournament favourite Dustin Johnson has suffered a lower-back injury following a fall at his rental home on the eve of Thursday's opening round of the Masters in Augusta. His agent David Winkle says he still hopes to play tomorrow. World number one Johnson fell on the stairs on Wednesday and "landed hard on his lower back". He is said to be uncomfortable but is resting and doctors have advised him to keep the injury stable. Johnson is due to tee off in the last group at 19:03 BST on Thursday evening. "Dustin took a serious fall on a staircase in his Augusta rental home," Winkle said in a statement. "He landed very hard on his lower back and is now resting, although quite uncomfortably. "He has been advised to remain immobile and begin a regimen of anti-inflammatory medication and icing, with the hope of being able to play tomorrow." The American, 32, won his third successive tournament when he beat Spain's Jon Rahm in the World Match Play final in late March. He has won seven of the 17 tournaments he has played since claiming his first major at the US Open at Oakmont in June, racking up another seven top-10 finishes in the process. 0 Response to "Dustin Johnson, 2017 Masters favorite, might not play due to back injury"